The retail market is currently flooded with speaker bars from companies you have heard of, some you haven’t and others yet that you wonder why they are making audio equipment. As you might expect, some bars are good, many are not so good and then there are those that fall into the hi-end elite category. The Artison Studio 46 would definitely be classified as one of the latter, with its heavy duty design, high end components, attention to detail and carbon fiber drivers. So while it looks high-end (and feels high0end due to its weight) only a thorough run through with a nice mix of audio testing would prove one way or another whether Artison has delivered a top notch audiophile bar. Similar to the Nano 1 we reviewed recently, the Studio 46 came tightly packed to protect the investment in this high-end speaker bar. 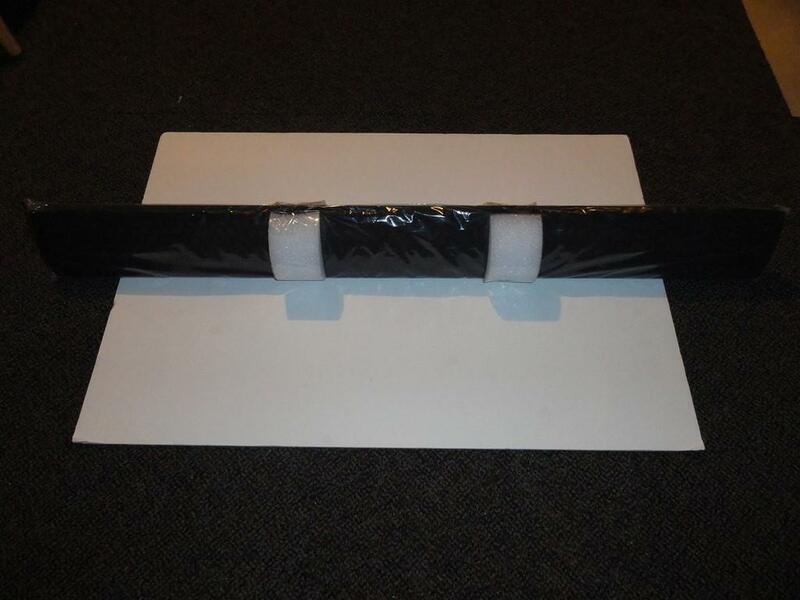 Not only did the box come with the bar, but also included the mounting brackets, hardware and another set of white gloves to protect your investment. 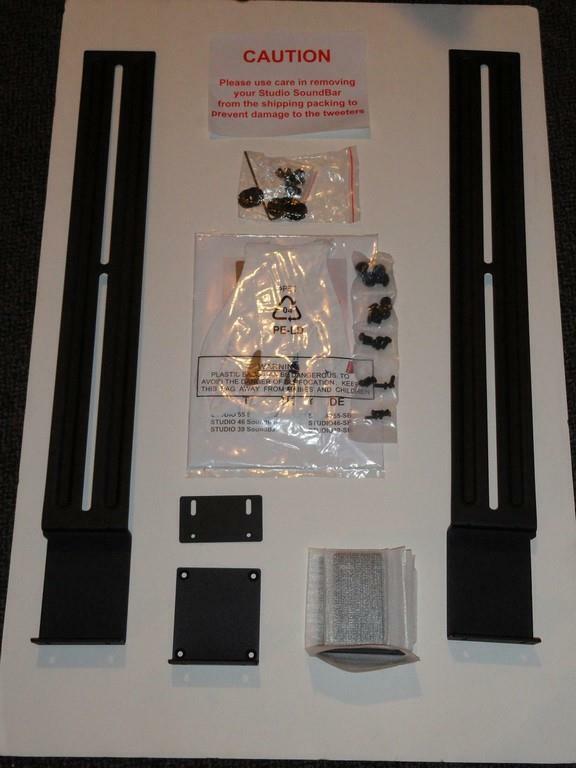 Shipped separately was a customer fit grill, designed to match your TV set for when the Studio 46 is mounted to it. As soon as you pull the Studio 46 from the box, you know that you have an exceptionally attractive speaker bar that simply exudes quality. From the thick-gauge aluminum cabinet to the gold plated spring clips and the carbon fiber texture of the drivers, it is clear that Artison hasn’t produced a run-of-the-mill speaker bar. One thing that stands out is the channels that run along the top and bottom of the speaker. 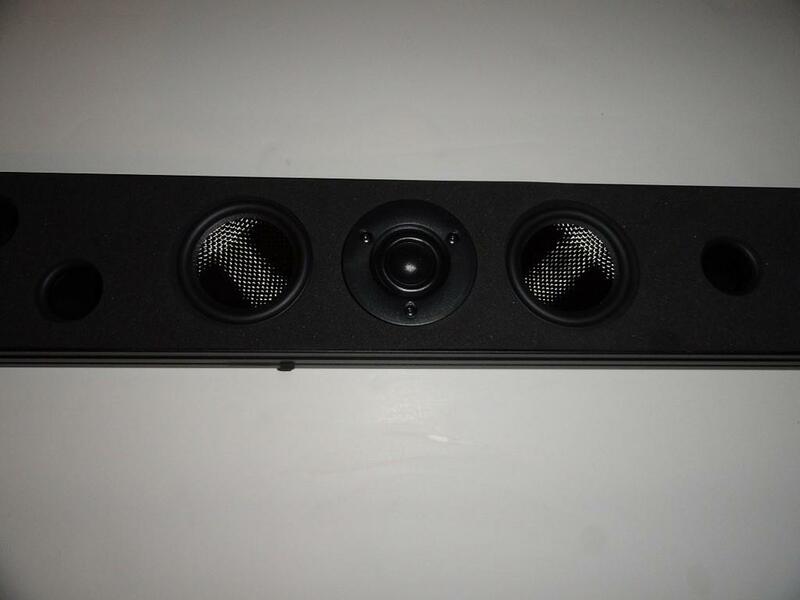 These are designed to be used with the mounting arms to position the speaker below your TV, but they are then completely concealed when you attach the grill to the cabinet, as it wraps around the upper and lower edges of the bar. As for the back panel, it is a simple enough, containing the six gold-plated spring clips to connect your L, R and Center speaker connectors. Couple this with a customer grill to match your TV dimensions and color scheme, and the Studio bars are designed to blend in seamlessly with your flat-panel TV. Let me preface this by saying that I did not follow the rules with the Studio 46. 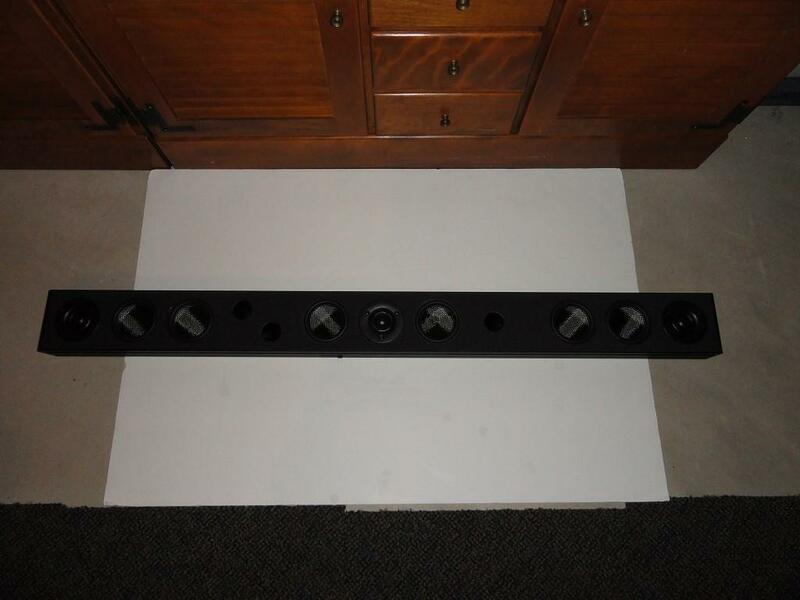 This audiophile bar has an ideal placement as part of a custom installation where it is attached by brackets and fitted to be immediately beneath or above your wall-hung flat panel. Instead, I actually tested it with my home theater projector in my lab, positioned below the projection screen. This has a couple of ripple effects, the first of which is that the custom grill doesn’t work so well (as mentioned above it wraps around the upper and lower edges of the bar) and to my ears, likely impacted how the audio reacted as it filled the room. The second is that with the speaker not as close to the video image as it would normally be, it was flowing to your ears from a longer distance than the video was to your eyes. While testing the Studio 46 audio, I need to disclose that the bar was tested continuously alongside the Artison Nano 1 subwoofer the majority of the time. This obviously impacts the entire listening experience, as the two Artison products definitely are in tune and compliment the heck out of each other. Having said that, I did run the Studio 46 through testing in all audio types without the Nano 1 in order to get a baseline on its performance as a standalone product, and my impressions still hold true whether the sub was utilized or not. But incorporating the Nano 1 sure makes the entire experience about as immersive as you can expect to get. Much like the Nano 1, my delta for testing was my existing 5.2 surround system for home theater and gaming, as well as my hi-end noise-cancelling headphones to gauge clarity. I put the Artison Studio 46 through quite a range of video playback to get a feel for how it would respond. Seeing as how I tested in alongside the Nano 1, the review selections will be identical, although I was listening for different things. As state din the Nano 1 review, I used the Studio 46 while watching several movies and TV shows and the live sporting events. What I really liked about the bar is that it created a nice even sound field that helped envelop the listening area. This was particularly true for any movie or show that was broadcast in digital surround, such as situational dramas and movies. As for the sporting events, the Studio 46 really was able to pass along not only the main audio, but also all of those ambient audio noises that are going on in the background. Things such as the crowd noise, banging of boards in a hockey game or the stadium announcer could be picked up during the broadcast. I think much of that can be attributed to the two side-firing stage tweeters that the Studio 46 employs. Where I was very pleased with the playback was while watching the previously mentioned movies in the Nano 1 review. I specifically chose “Fury”, “The Incredibles” and ‘The A-Team’ due to their blend of action, direct dialog and soundtracks. After testing several scenes in all three, I was extremely impressed with how well the Studio 46 rendered the entire surround field as if it was a 5.1 speaker system. The fact that I couldn’t tell that I had a single speaker bar emitting the sound was more impressive with the clarity, surround effects and a complete lack of struggle to reproduce any of the soundtracks audio. As I mentioned above, while the drivers and main tweeters are impressive, the addition of the side firing stage tweeters makes the difference from good to great in my mind. 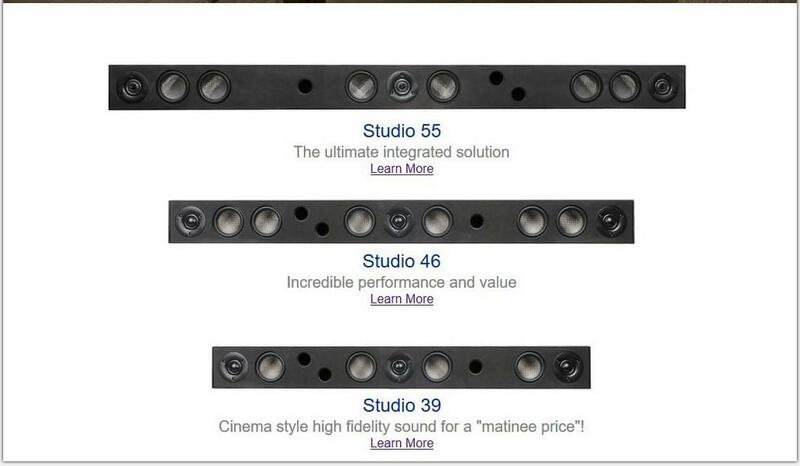 When I started playing music through the Artison Studio 46, I finally heard a perceived flaw in the speaker bar. Despite playing with the settings on my receiver, going from stereo to surround to direct and so on, the Studio 46 continued to reproduce music with a noticeable bright spot in the center of the listening area. Now this wasn’t a huge deal, but with the way it performed with video audio and with game audio (below) I was a little surprised that I couldn’t get the music playback to blend evenly across the sound field. Outside of the bright spot, the music playback was exceptionally clear and accurate, as I could hear all of those little nuances you would find in songs like Crosby, Stills and Nash’s “Southern Cross” and Jay-Z’s “Empire State of Mind”. In addition, I played through several hours of radio play during testing and also streamed many other songs and all sounded great while filling my test lab with music. As to the bright spot, this could have been a result of how I had the bar placed for testing. It was on the lower end of the height where you would expect a speaker bar to be located. In addition, it is a speaker bar, whether high-end or not, so the L and R speakers’ placement is incredible close together, which also could have contributed to it. When standing offset, the music sounded fantastic and reached my ears as I would expect. While I was testing games with the Studio 46, I was very pleased with how well the speaker bar rendered the various games soundtracks. As stated before, the majority of the testing was conducted with Fallout 4, Rock Band 4 and many other titles. However, the selling point for me was that opening title sequence of Fallout 4 with the piano notes and just how much more rich the audio sounded from what I was used to. Coupled with the in-game experiences, from just exploring, to major battles to the dialogue, the Studio 46 is a fantastic speaker for gaming. When I tested with Rock Band, I was kind of expecting to run into that same hot spot as with the music playback. However, it never materialized, as I believe the game audio is mixed differently that straight music playback. Regardless, the game audio playback was really good no matter whether it was my voice, the pre-recorded vocals, crowd or the instruments. Frankly the playback was what I expected it should be which is a good thing. As for the rest of the games, the audio within Powerstar Golf really stood out, as there is a lot of ancillary sounds found on a golf course (in addition to the snazzy music score) such as birds, wind and so forth. Other titles like Super Stardust HS and Madden came across clear, concise and exactly as I would expect. Overall, the Studio 46 has made me wondering whether it is time to update my choice of reference speakers for my gaming rig. When combined with the Nano 1 sub, the Studio 46 was able to render the game audio exceptionally, allowing me to become even more immersed in Fallout 4 and other titles I had played previously. As mentioned above, the Studio 46 did a great job on movies and TV and sounded good on music playback outside of the bright spot. I was pleasantly surprised at how well the Artison speaker bar handled itself, although now that I have reviewed both the Studio 46 and Nano 1 I probably shouldn’t have been. The Artison Studio 46 audiophile bar is probably the best sounding speaker bar I have ever experienced. It was able to deliver one of the best overall sound fields I have heard while playing games with a speaker bar as well as immersive audio for movies and other video audio playback including movies. My only concern is that it seemed to have a noticeable bright spot during music-only playback when sitting dead center of it; even with adjusting through the audio modes form my receiver. This could have been due to my positioning, but it didn’t occur during video and game play audio testing. Regardless, much like the Nano 1, the Artison Studio 46 (and likely the entire Studio series) are on the high-end of the price point at $1,399, but should be a strong consideration if you plan to upgrade the audio attached to your flat-panel or do a custom build. 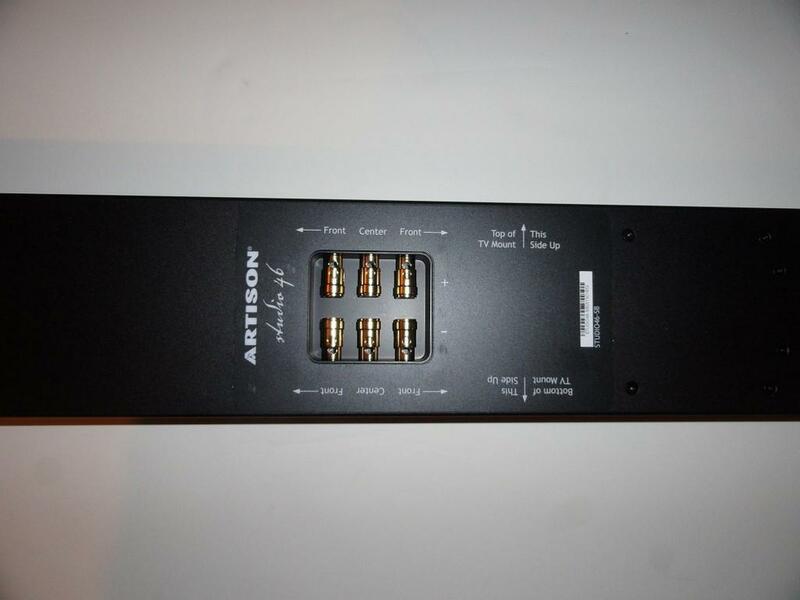 The Artison Studio 46 is probably the best sounding and most well-constructed speaker bar I have come across. Although it has a bit of bright spot during music playback, the video and game playback were exceptional and created the best sound field I have heard from a speaker bar.